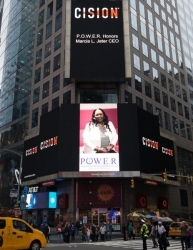 Sayreville, NJ, October 11, 2018 — Marcia L. Jeter of Sayreville, New Jersey has been honored on the famous Reuters Billboard in Times Square in New York City by P.O.W.E.R. (Professional Organization of Women of Excellence Recognized) for her outstanding contributions and achievements in the field of event planning services. Marcia Jeter is the Founder, Owner and President of a family-owned and operated event planning business called Princess Sweets, LLC. They specialize in providing full scale party favors including candy bars, dessert bars and ice cream bars for weddings, bridal showers, baby showers and candy buffets. The company was created to satisfy a universal sweet tooth and provide a variety of merchandise. Princess Sweets are available to take orders 24 hours a day, 7 days a week. She is also the owner of My Little Princess, LLC, Your Little Prince, Empire Deals, Royal Empire and My Little Prince & Princess. Marcia is responsible for overseeing wholesale and retail operations and for opening new locations. After starting out with one kiosk at the Menlo Park Mall, within in its first year, her business has expanded to 11 locations in New Jersey and will be going international. It is Marcia’s goal to have her shop in every mall. They recently had their Grand Opening in the Woodbridge Center Mall. Ms. Jeter is an avid supporter of the Make a Wish Foundation. She also supports Breast Cancer Awareness, the Alzheimer’s Association, Diabetes Association and Rebuilding Warriors. In her spare time she enjoys attending her local church, bowling, shopping, vacations and travel. Previously, Marcia served 22 years as a Legal Assistant. She graduated from the Katharine Gibbs Secretarial School in 1986 and completed Event Planning and Wedding Planning courses through the New York Institute of Art & Design in 2016. Marcia is affiliated with the NAPW, NJAWBO, NAWBO, AACCNJ and the NAACP. She is also a member of the Edison Chamber of Commerce, the Woodbridge Chamber of Commerce, Paramus Chamber of Commerce and the Somerset County Business Partnership.